This is the savoury breakfast for those with a sweet tooth. It's sweet, and satisfying without being loaded with sugar, and believe it or not, it's healthy too! These quantities serve two or three people depending on serving sizes. Combine the grated sweet potato, the egg and the flour in a bowl. Mix well. Heat a large pan or skillet over a hotplate heated to the highest temperature. Add a tablespoon of oil, and swirl to coat the pan. Drop in a large, heaped tablespoon full of the mixture, and gently form it into a circle. Allow it to brown for about two minutes, then gently flip it over to cook on the other side. Lower the heat to ensure that it cooks through, without burning on the outside. Pan fry for about four minutes, flipping once more to ensure even browning and cooking. Remove to some foil wrap to keep it warm while you repeat the process with the rest of the mixture. To serve, place on hash brown on a plate, spread with a little of the smooth ricotta, and top with two of the semi dried or oven roasted tomato slices, and a sprig of fresh basil. Top with a second hash brown, a little more ricotta, two more tomatoes, and garnish with more basil. Each mouthful is like a party in your mouth! Really. Crunchy hash brown, smooth ricotta, sweet tomato, fragrant basil. Awesome. Good for lunch or dinner too! Hello lovely friend! I was absolutely delighted to see you at this weeks Roses of Inspiration :) Did you know I was not following you??? I was shocked when I came to your blog this morning and didn't see me in your GFC followers - I am so sorry about that! 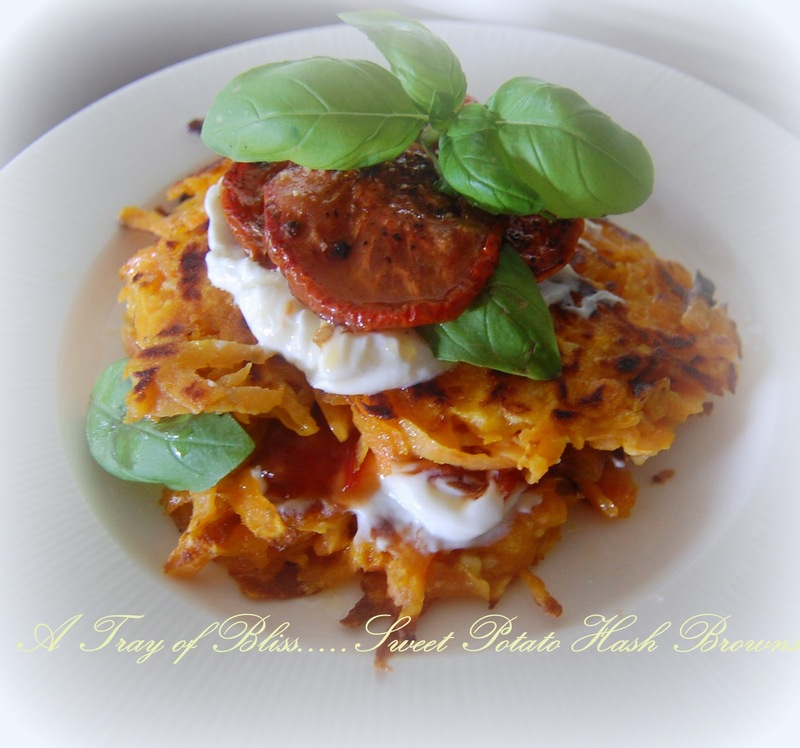 Your sweet potato hash browns look simply divine! I would love to try them sometime :) Thanks for sharing with ROI. I hope you're able to join us again next week. Love and hugs! Great twist on hash browns! Oh these look so yummy Mimi, will definitely try these. Oh wow, this sounds simply delicious! I love sweet potatoes. Thanks for sharing the recipe with SYC. Pinning. Hello lovely friend! Your delicious post has been featured at Roses of Inspiration today. Thank you for joining the party and I hope you're able to join us again. Hugs! Mimi, this sounds wonderful and right up our alley! I will be pinning this recipe :) Thank you for sharing on the Art of Home-Making Mondays this week! It sounds delicious, and my child just might like it for breakfast, because she loves sweet potatoes, but I will change the flour to her preferred flour mix.